My introduction to Photoshop was slightly unusual. Four years ago, with a lot of trepidation, I signed up for a digital collage class in Boca de Tomatlan, Mexico, (just south of Puerto Vallarta). Photoshop was a requirement and I had barely installed it when it was time to go so I was sure I would be the class dunce. But, off I went and arrived in the small fishing village that took me back 50 years in time, crossed the river that divided the village in a ponga powered by a small boy with a long pole and arrived at Casa de Artistas where I met Robert Masla, the instructor. The next day I found out that I was the only person in the class so I had a week of one-on-one tutoring and coaching. Every day, we explored the village, took hundreds of pictures and returned to find ways to create art using the incredible power of Photoshop. Bob is a fine artist and a wonderfully encouraging teacher. In that week, many things changed. I started to look at photography as a gathering process rather than a search for "pictures." Everything became an "element" ... something that carried meaning that could be incorporated into a bigger story. I also discovered the magic of Photoshop that happens when elements are layered together and allowed to interact with each other. Sometimes it seems like I came home from Mexico with a guru in my computer. Sometimes she is frustratingly vague and incomprehensible but sometimes she snaps her fingers and something new appears ... something I could never have imagined ... something that sometimes takes my breath away. 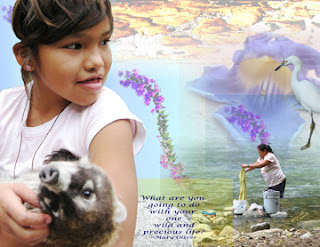 About the image: My first digital collage: "Wild and precious life" Borrows the great question from Mary Oliver and applies it to the village life of Boca de Tomatlan where grandmothers still wash clothes in the river while children play with a mountain mongoose. How divine -- photoshop is one of those programs I keep thinking I'll venture into and then don't. Perhaps... with your inspiration here, I'll do it! That's an accomplished first. I like the collage a lot. What fun that must have been, working one with one.